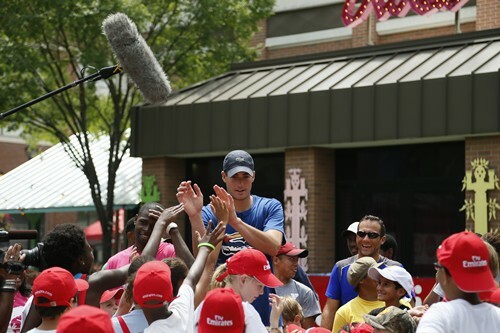 John Isner, the top seed at the 2013 BB&T Atlanta Open, took time away from the court to participate in a youth tennis clinic at Atlantic Station's Central Park in Atlanta, in which approximately 100 children from the YMCA of Greater Atlanta's tennis program had the opportunity to hit with local teaching pros, have lunch and watch tournament matches. The event, held on Wednesday, July 24, was sponsored by Emirates Airline, which has partnered with USTA Serves, the national charitable foundation of the USTA, to bring the fun and fitness of tennis to children across North America as part of the “Emirates Returns” program. Emirates Returns provides underserved youth in the various Emirates Airline US Open Series markets access to the sport of tennis and opens up educational opportunities for them.